Auriga is a large northern constellation with one of the brightest stars in the heavens, Capella. While this constellation is most prominent in the winter, since it is so far to the north, Capella serves as a reference star for much of the year. 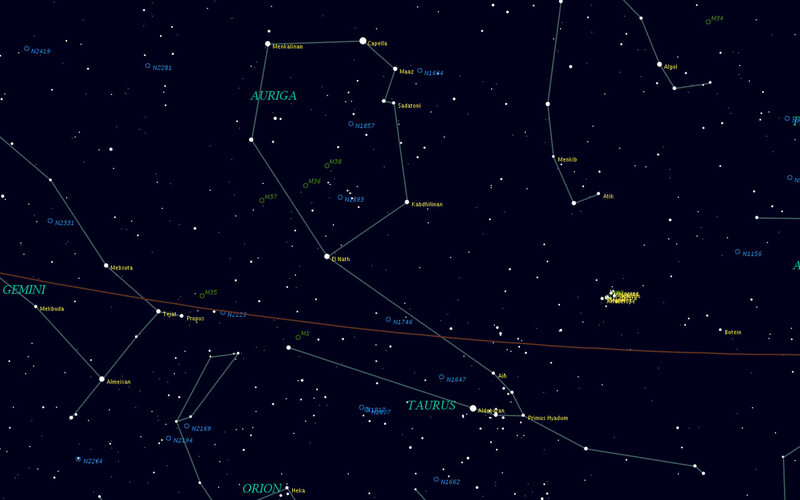 Auriga has several fine Messier objects, star clusters suitable for binoculars. It is recommended that you study Taurus first. Alpha Aurigae better known as Capella, is the most northerly first-magnitude star. To find the star, begin in Taurus and go all the way out to beta Tauri, the tip of the Bull's upper horn. Between this star and the North Pole is the bright and dominant Capella. The star marks the Charioteer's left shoulder. Beta Aurigae, just to the east of Capella, is the Charioteer's right shoulder. The Greeks considered Capella the She-Goat (which Capella means). Just to the south and slightly ahead of Capella are the three 'kids': epsilon and zeta and eta. In binoculars the group makes a cosy compact group. The most northerly of these stars -- epsilon -- is a late addition; in antiquity zeta and eta were known respectively as "the western kid" and "the eastern kid". The two make a nice colour contrast, orange and icy-blue. Every 27 years epsilon's magnitude drops from 2.9 to 3.8 and remains so for a year before regaining its former brightness. The orbit is so precise that the star is a favourite subject for study. Ten degrees NE of Capella (about one and a half binocular fields) is delta, the head of the Charioteer. Delta Aurigae isn't interesting in itself, but this part of Auriga brushes up against one of the more difficult constellations Camelopardalus. You'll be coming back here when you study that constellation. Returning to Capella, a little more than one FOV east is beta Aurigae (1.9). Northeast of beta and running south for ten degrees are a scattering of 5th-mag stars. These are the tips of the whip wielded by the Chariotter. They all have the same Greek label psi (psi1 to psi9).